The era of localized banking with manual paper transactions would remind the earlier generation about the time and physical pain of record keeping meted out from the banking system. The long queues, the token systems, necessity of physical presence etc. even for transactions such as depositing or withdrawing a few currency notes must have taken a toll on health and career, leave alone the pain of ones who ran pillar to post for loans. With the emergence of machine learning, many industrial sectors were vying to fast catching up with the Machine Learning, and thankfully banks didn’t take the backseat. Over the years, we were slowly phased into a dynamic banking system where we could withdraw money from ATMs and then came the internet banking and mobile banking. The banking revolution has changed the localized branch-based system to networks and digital landscape creating utmost convenience to the end users. However, the machine learning technology was still in its initial stage then. Now that machine learning is rapidly expanding, the finance industry is reaping maximum benefits. According to Gartner, machine learning would replace humans in financial transactions by 2022. Read on to find out machine learning use cases in finance. When it comes to online fraud, banking, and financial organizations are always at a higher risk of getting cheated. In fact, The Global Economic Crime Survey reveals that at least of all the enterprises that are victims of online frauds, finance organizations constitute a whopping 25%, which is undoubtedly alarming. This doesn’t stop here. Machine learning is helpful in detection of the fraud as they process the transactions within micro-seconds without any manual intervention. When the transaction is processed steadfast, there’s a zero scope to fraud. Machine Learning algorithms are outstanding when it comes to identifying the non-intuitive patterns and tag as a malicious attempt. Once a pattern is recorded as fraud, no one on earth can break into the server or perform a fraud transaction with the same algorithm. When it comes to loan sanctioning, banks would typically evaluate the candidate’s creditworthiness through different sources, which includes manually extracting the credit reports to ascertain the applicant’s financial health. The linear discriminant analysis (LDA), which is one of the machine learning techniques, an applicant’s financial health can be swiftly retrieved. The algorithm detects whether the applicant has the capability to repay the loan. Based on previous financial behavior (such as payment patterns etc), he would be placed under non-default and default category. Accordingly, his loan application can be accepted or turned down within minutes of processing. Yet another study by Mues and Brown, five types of machine learning algorithms were experimented to know the credit history of the candidates, and all the methods proved beneficial. Even as complaints against the bank’s service and customer support pile up on the internet, banks are apparently leaving no stone unturned for ensuring that the grievances reach to logical conclusions. By leveraging the latest machine learning algorithms, financial organizations have already started offering automated chatbots wherein customers can input their grievance and get the accurate response within a fraction of seconds while the issue would be escalated with a complaint number without further delay. In fact, Gartner predicted that at least 25% of financial organizations would utilize ML-based chatbot/ customer support. Financial enterprises are leveraging machine learning techniques for predicting the customer behavior and pushing the loan notifications accordingly. If you have come across various ad pop-ups frequently the moment you apply for a loan or landed on a loan page of a bank’s website, you would have understood by now that the science behind it is—machine learning. Even eCommerce websites are at the forefront to make the best use of ML. The profound algorithms swiftly track the data and your search or applications, store them and based on your previous activity, you would receive the suggestions in real-time. Conclusion: Machine learning is undoubtedly a robust and a game changer. According to iProspect 2018’s financial survey, at least 55% of respondents said that machine learning would help them make the right decisions. 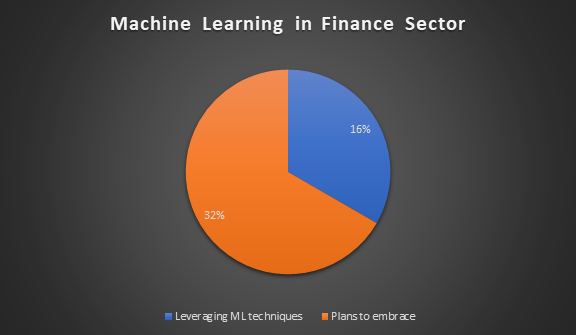 Another survey conducted by Bloomberg revealed that only 16% of financial enterprises embraced machine learning while 32% had plans to adopt it. With so many reports and trends stressing that ML is going to transform the finance sector for good, we have no other option other than to accept it. If you are in search of efficient machine learning, you can get in touch with us. A leading end-to-end digital transformation partner, we have state-of-art machine learning expertise to bolster your business. Please feel free to email us at info@techwave.net.